This interesting little gem appeared on eBay in July 2015. 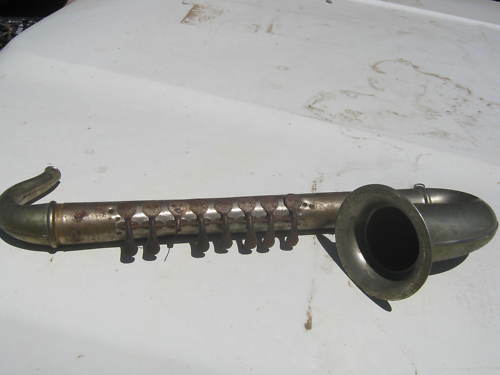 The Melody Saxophone is yet another example of the German-made blow accordions that seemed to be popular in the first half of the 20th century. 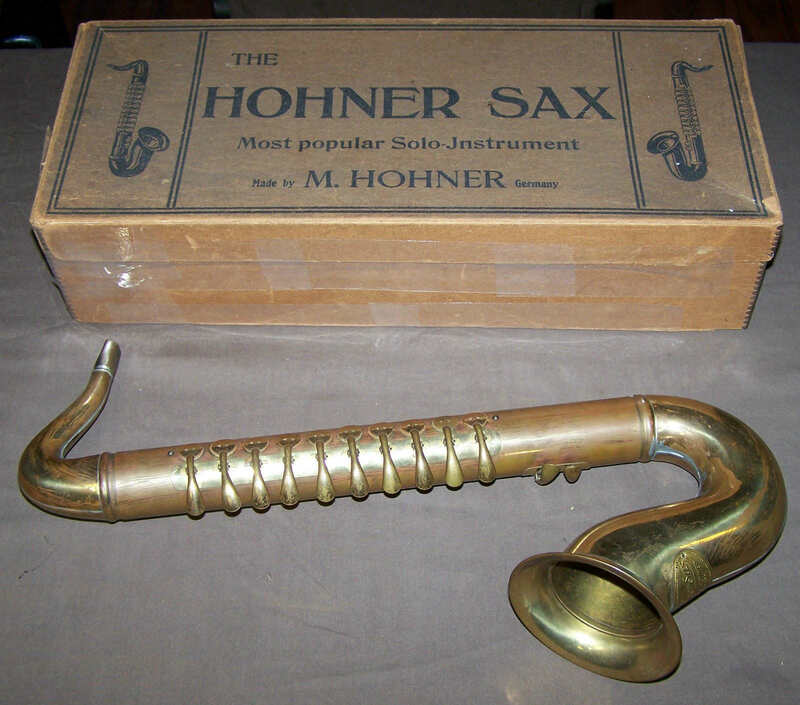 It bears a striking resemblance to The Hohner Sax, and even this no name metal sax from an auction years ago. The Melody Saxophone is a 10 key model (with 2 of the keys being bass keys). This is a metal (tin?) 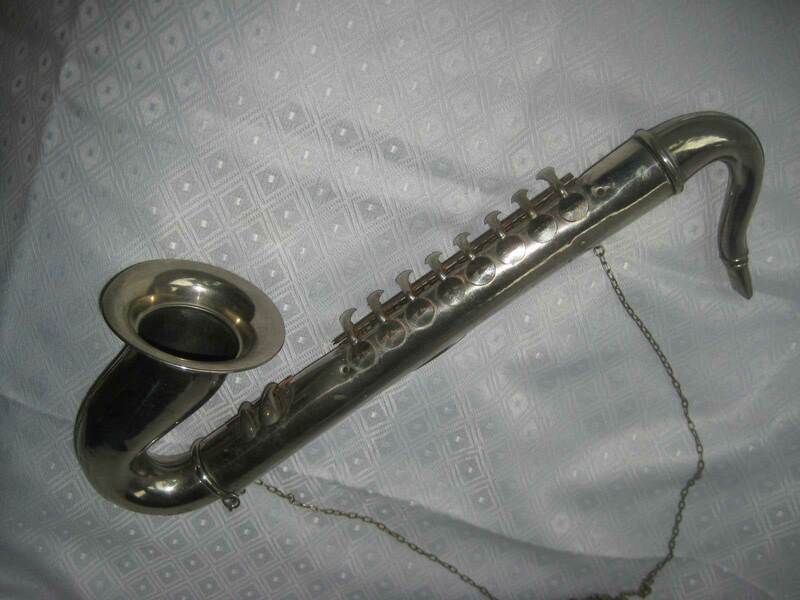 VINTAGE CHILDRENS TOY BLOW SAXOPHONE Made In Germany with name plate “The Melody Saxophone”. I was told by the auction house that they believed it is mid 1950s, but I have no way to verify.. could be earlier or later? PRETTY NICE SHAPE, It has a few dings/dents (see pictures). It works when blown in and keys are pushed. There are 8 keys plus 2 keys and a chain for around the neck. The bottom portion of the center seam appears to be open a bit, but could be glued down if the buyer chooses to (see last picture). It was made with tiny screws and has the chain screw as well as the nameplate holding the seam intact. (see closeup pictures to see screws, which are definitely old) It appears to be all metal including the keys and chain. It is about 16 inches long. This is definitely not for children to play with. Only a collector item! It has sharp edges!